Although the alphabet structure may look like a handy gimmick, the articles are valuable, in and of themselves. And the gimmick helps me find more topics to write about…. A is For Appraisals Don’t leave your employees in the dark! Regular acknowledgment of individual contribution is a key ingredient for having a motivated workforce. Here are some good ideas for a process that will give you positive results. organizations, and none of them will cost us a penny! C is for Critique or Criticism Seemingly minor issues can actually ruin a good working relationship, turn motivation into resistance, and cause loss of productivity. Here are three specific tactics you can use to give feedback more effectively! D is for Differences Each of us has a unique way of looking at the world, and a unique way of thinking about the situations we are in. In order to become as productive as possible ourselves, and to help our employees be as productive as possible, we all need to be open to exploring different viewpoints. Here are some real-life examples to get you started! E is for Employee Expectations Owners and managers often complain that today’s employees aren’t as motivated as they used to be. That they may not be as loyal as they once were. That may be the case, and the reasons for that may not be what you think. Here’s a less obvious reason for the lack of commitment and passion. 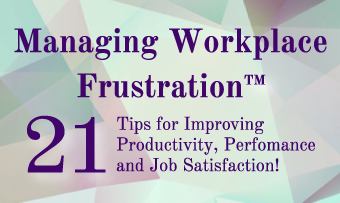 F is for Frustration What are the things that bother you most at work? Are they the missed deadlines, the demands of customers or clients, the attitudes of staff, the relationships with colleagues, the red tape and bureaucracy? Or something else entirely? G is for Growth Growth is a natural part of life. More than that, it is the requirement for a fulfilling life. Even when we cease to grow taller, growth is a critical part of our well-being. Whether it’s learning new things, accomplishing daily tasks more effectively, or even getting rid of bad habits, we all need to grow on a regular basis!